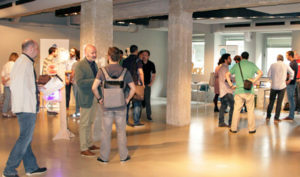 On the 28th of June, the first Open Maker event organized by Tecnalia took place in Bilbao, with the collaboration of Enpresa Digitala, which was attended by more than 70 professionals with a common interest: to meet other agents with whom to establish Collaborative links in open innovation for productive products or processes and open manufacturing. 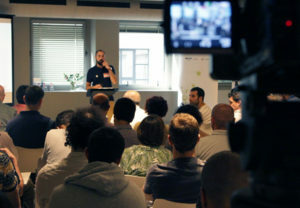 This event was the first meeting of the Bilbao LES, the kick-off, of a European Community that is growing and generating a lot of interest both between makers and companies as well as in different economic and social agents. There were many questions about collaboration formulas, future results of work and how to participate in a contest of ideas in order to develop 5 prototypes of Open Manufacturing that solve real needs of manufacturing companies, and that will be awarded Economically for their development. One of the mains concerns that raised from an intense debate was the owning, rights and licensing of the resulting products. A workshop tackling all these concerns is needed and will be carried out in the near future. For a first matchmaking we had an exhibition space with the presence of Deusto FabLab, OD&M Platform, Instituto Don Bosco, 3D Lan, FabLab Santander, Geko Navsat, The Open Shoes, Muka Design Lab and Domotek as a representation of open technology and its projects In different sectors. These meetings will continue and above all, this community will continue to grow in this new framework of collaboration and co-creation that has just started.